A gripe aimed at pop musicians who take a stab at composing classical music is that they approach it from a pop-minded point of view, i.e., simplistic. In the case of the National guitarist Bryce Dessner, you'd have a hard time making those accusations stick since he was never fully immersed in the pop world to begin with. He graduated from Yale with a master's degree in music and has immersed himself in the world of contemporary classical music by rubbing elbows with Steve Reich, Jonny Greenwood, Nico Muhly and now the unshakable Kronos Quartet. 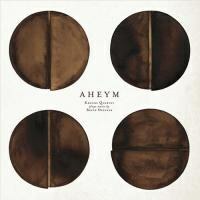 Bryce Dessner: Aheym is an album of four chamber music compositions by Dessner. And by any yardstick, be it one provided by fans of the National or connoisseurs of the art of the string quartet, it's not bad. A major part of its charm is just how much sound comes out of four wooden instruments. The first second of the album demonstrates this. The unison attack of the syncopation, the range between each instrument, the drop-dead professional musicianship of the Kronos Quartet and for all we know the natural reverb of the studio line up perfectly to slap the listener in a manner not unlike big grand symphonies. "Aheym" is a Yiddish word for "homeword", but the start of the ten-minute title track feels like a nuclear launch. After a little more than 90 seconds of these fierce, intense attacks, "Aheym" settles into its course, resting on a minimal ostinato. On its "homeward stretch", the notes almost become too rapid to process. All four musicians are sawing away with such fervor that you may think the music will derail at any moment. It does not. "Aheym" ends with less majesty from which it was spawned, but just know that that's quite a bit to overcome. The final track is the one tailored for climax. "Tour Eiffel" was commissioned by the Brooklyn Youth Chorus, a musical adaptation of a poem by Chilean writer Vicente Huidobro. At eleven and one-half minutes, it's a journey. The choir begins along, eventually accompanied by an chamber music arrangement that actually reflects Dessner's indie day job -- sparse piano, unaffected guitar and a willingness to watch a boiling pot. The dynamics creep up with the entrance of a snare drum and the choir's syllabic incantation wanders dangerously close to cinematic cliché. All told, "Tour Eiffel"'s rise and fall comes off as a bit formulaic. The remainder of Bryce Dessner: Aheym is not like that though. "Little Blue Something" takes gingerly steps outside the box as Kronos rolls the musical mold in their hands to the point where the focal point and/or downbeat gets lumped with the entire canvas. It's a sparse one at that, leaving things unsaid when stating them would spoil a transporting listen. "Tenebre" is the collection's longest track. It's plaintive, languid, suddenly jaunty, disconnected, mildly tense and -- dedicated to Kronos Quartet's production director, Laurence Neff. If "Tour Eiffel" was the predictable ending, then "Tenebre" is the oddball curveball. The piece has a shape, but it's nothing that you would determine from the first two minutes of it. In the Kronos Quartet's 40-year career of melting faces chamber music style, it's doubtful that Bryce Dessner: Aheym will ever rank as one of the group's top recordings. It will, however, chronicle the rise the compositional talents of one Bryce Dessner. After all, the guy's not even forty yet. There's more to come. There's got to be.